The A.I.R.S. 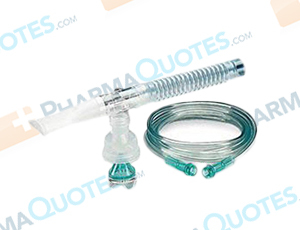 Disposable Nebulizer is part of the medical devices and supplies class and is used to deliver oxygen and breathable medications via the mouth and nose. The A.I.R.S. Disposable Nebulizer is a single use nebulizer that is easy to use and assemble. The kit includes a tee adapter, 7 feet corrugated oxygen tube, mouthpiece, and reservoir tube. A Nebulizer helps patients of all ages take their prescribed treatments efficiently and comfortably. Disposable nebulizers are designed to be used with a home-use compressor, and should be used only according to doctor’s orders and dosage recommendations. Most disposable nebulizers are used in hospitals because they shouldn’t be used more than ten times before being discarded. Using a disposable nebulizer longer can lead to slowed treatments, and less medication delivered with each use. Disposable nebulizers are convenient and require little cleaning and even less maintenance. Before purchasing the A.I.R.S. Disposable Nebulizer, make sure it’s compatible with your compressor and mask. It’s important to follow manufacturer, pharmacy, and doctor’s instructions when using this and other medical products. General A.I.R.S. Disposable Nebulizer Warning: The above information is for informational purposes only and is not meant to be a substitute for professional medical advice, diagnosis or treatment. Please seek professional medical advice before starting, changing or terminating any medical treatment. Pharmaquotes is not offering medical advice, pharmaceutical recommendations or endorsing any specific prescription drug, pharmacy or other information on the site. Pharmaquotes provides no warranty or guarantee for any of the discount data, medication, or other information.